More 1.2 from Hog Bay Software is a digital notebook that makes it easy to record and organize your thoughts, ideas and notes. Mori can function as notebook, project manager, research assistant, and more functionality as Mori able to keep almost all information such as notes, tasks, clippings, and writings. More has an organizational notions of files and folders, with Smart Folders feature that show notes that matched the criteria automatically. 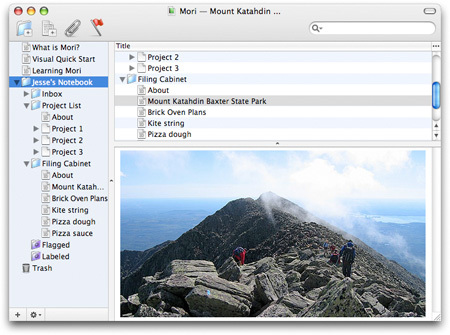 Mori is expandable and requires Mac OS X 10.4 or later.